Getting married later in life means you’ve already got your toasters, garlic presses, and Egyptian cotton sheets. So when confronted with the daunting task of registering for gifts, Brandon and I were stymied. We didn’t really need any things. What we really wanted was to go on a trip of a lifetime that we could not otherwise afford. We wanted to go on safari. 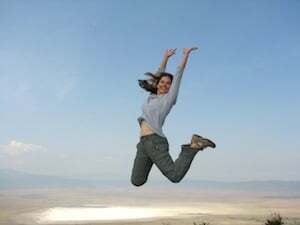 On the advice of a friend, we signed up with Traveler’s Joy and voila, the funding for our trip starting to come in. After our picture-perfect wedding in April (married on the beach in southern California in a small intimate evening ceremony, followed the next day with a beach party extravaganza), we had a few months to recover and plan our dream trip with the help of a travel agent friend. She had several recommendations for travel companies who dealt in safaris, and we ultimately chose African Travel in Tanzania. They were thorough, professional and highly organized. They would take care of the lodging reservations, arranging our safari guide for the week, and any other details we would be needing while there. This was perfect. We had no idea how to organize a safari ourselves, so they were our saviors. And so three inoculations, one new passport and a pocketful of malaria pills later, we were on our way to Africa. 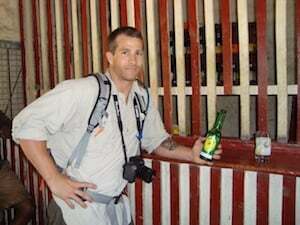 I had never been to a third-world country and Brandon had never been overseas period, so we were both in awe of the hustle and rush of people, animals, unruly traffic, and unfettered noise that we encountered in Arusha town in Tanzania. In contrast, our Serena lodge hotel was lovely -- a series of small bungalos called rondavels marching across the hillside above a small lake. Only the mosquito netting and a large rhinoceros beetle in the shower reminded us that we were not in Kansas any more, Dorothy! After hot showers and a little dinner, we both passed out, succumbing to the rigors of overseas travel. We were up at dawn and after a breakfast were taken on a nature walk around lake Duluti. Our guides -- a lean Bushman named Benson and a quiet park ranger called Mr. Anton with an enormous shotgun -- walked us around the lake pointing out monitor lizards, blue monkeys, and dozens of colorful birds. “This is a banana plantation,” said Benson, as we walked through a grove of broad-leaved trees. “The owner makes banana beer.” Now that sounded like a true African treat, and we told him we would like to try this fabulous banana beer. He looked momentarily stunned, then exchanged a glance with Mr. Anton, shrugged, then led us down the hillside into the tangle of old-growth trees, and into a tiny whitewashed house. Inside, a group of teens were playing pool on a warped and torn pool table, and they watched us as we walked past to the ‘bar’, a small ante-room with a bored-looking girl standing behind a gate of wooden slats. Our guide spoke to her and she delivered up a banana beer for us and a Coke for him. The beer was delicious; sweet and bubbly, but very potent at 10% alcohol per bottle. A chuckle emanated from the corner of the room, and Benson introduced us to the banana plantation owner, who sat enjoying the fermented fruits of his labors. He raised his own beer to us and drank deeply. After lunch we were collected by our safari guide, Hassan, with the Ranger Safari company. Ever-smiling with a deep baritone voice, Hassan introduced us to our traveling companions for the week, Judy and Andrew, a South African couple also on holiday. We packed into the Range Rover and were off, back through Arusha, the town of no stoplights and a thick crush of people, then out into the open expanse of the countryside toward Lake Manyara. Hassan sped along happily, explaining that we were on one of the only paved roads in the country. He pointed out Masai Villages, both abandoned and in use, and soon enough we saw some Masai themselves, a tall and spare people wrapped like electric red-and-blue burritos in their colorful checked shuka, herding their cattle alongside the paved road. Occasionally, Masai children would hop up and down on the side of the road, hoping for a bottle of water or a piece of chocolate from the tourists inside. More than once we stopped and gave them a treat. We drove through another small town, a bustling farming village known for their sweet red bananas and epic malaria problem, then climbed up and up, to the top of a small mountain where we would stay for the night at another gorgeous Serena Lodge high above Lake Manyara. At dawn we were out on the hillside looking down at the Lake, binoculars in hand. Could we see any animals yet? There were several dots along a far plain, but it was too far to know what we were looking at, if anything. But we did get a good eyeful of the lake, a large alkaline body of water stretching along the eastern horizon, edged with white from mineral deposits. Our first animal sighting was actually at breakfast, a bushbuck grazed in the lawn just outside the restaurant, and we had our omelets while he had his grass. Hassan collected us in front of the hotel, then with Andrew’s assistance, unhooked the roof of the truck and pushed it upwards on hinges! This ingenious telescoping- roof idea meant we could stand in the back of the truck and get an unobstructed 180-degree view without being baked to death by the sun. We headed down the hill again to Lake Manyara Park, excited and thrilled to finally be on safari. Immediately upon entering the park we came upon a troupe of baboons sauntering down the road. They capered and complained around the truck as we went slowly through their ranks. 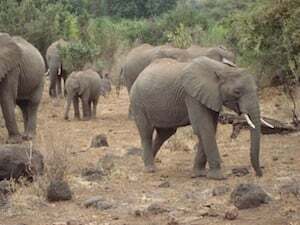 Then around a corner, not ten feet from the road, were a dozen elephants, including a few yearlings and some newer babies, according to Hassan. Enormous and nonplussed, they wound their trunks around tree branches then quickly stripped them of leaves and stuffed them into their mouths. As the elephants breakfasted, a Masai giraffe strolled out from the trees and ambled down the road in front of us, just as casual as could be. To see a giraffe in the wild is unlike seeing them at the zoo. First of all, they are enormous. But moreover, they are peaceful and calm and chill. They’re never in a rush, and since they really have no predators, have no concrete worries from day to day. They are the surfers of the Serengeti. I love giraffes and we caught up to this one as he ambled into the trees to have a snack, and we watched as his blue tongue snaked out and around the thorns of the acacia to get at the leaves he wanted. Soon the high trees thinned out and we were traveling across a grassy plain toward the lake. Vultures, hornbills, and a distant herd of zebras gave us a thrill. We asked Hassan to stop so we would look at the zebras, but he smiled and said “there are many hundreds of zebras to be seen very soon.” We figured he should know, so instead we studied the bush pigs, kneeling on their front legs in the grass as they ate. At the edge of the lake was a hippo pool, and they snorted and twitched in the water, non-menacing from afar. As we turned back toward the park’s interior, the trees again grew thicker and we cast about, looking for leopards, an animal Judy wanted very much to see. Hassan stopped the truck quickly and shut it off, then he himself got out his binoculars. He pointed into the trees. And sure enough, in the low slung branches of a bent and worn acacia was a lioness, sleeping hard, all four limbs hanging off either side of the thick tree branch, mouth smiling and eyes squeezed shut. A cozy, cuddly housecat. Nearby, two cubs cuddled together in the blasted and broken stump of another tree, peering back at us with as much curiosity as we were giving them. On our way out of the park we stopped alongside a marshy area where a number of buffalo were eating and wallowing. Buffalo are stunningly big, like three full-sized cows smushed together into one huge hulking beast. They looked at us, heads high, eyes bright, unafraid and daring. As well they should; we would be no match for even one of them. After lunch we headed toward the Serengeti, a journey of about six hours by car. Along the way Hassan chatted with us about anything and everything Africa-related, and never did we ask him a question he could not answer. What kind of bird is that? A Kory Bustard. It is the largest flying bird in Tanzania. What do the Masai eat? Milk and meat. Nothing else? No. Well, sometimes chocolate when the tourists stop for them. A big smile. Several hours later we entered the Serengeti, a vast, empty plain reminiscent of Kansas or Oklahoma, but in which you become part of the food chain. Large rock formations sprouted up like warts from the earth as we entered a long flat stretch of road. Hassan suddenly swerved onto a smaller side road and pulled right up alongside a sleeping pride of lions, thirteen in all. They lay in a pile, comfortable and confident in their place in that food chain, and barely opened an eye when they heard us approach. They even had the audacity to yawn, exposing sharp, ivory teeth, then licked their lips and flopped back down into the pile. Back on the main road, we had only gone several minutes when we again came to an abrupt halt. And there, off in the distance, was a cheetah on a termite mound. Brandon stood up, exclaiming “get the (enter expletive here) out of town!” and jumped onto the seat to get a better view. Now, it has to be said here that Brandon’s absolute favorite animal in the world is a cheetah, and he had come to Tanzania hoping to see one, but had been told by many in the know, including his best friend who is from South Africa, that seeing one is rare, and not to be disappointed if he didn’t bag a cheetah this trip. 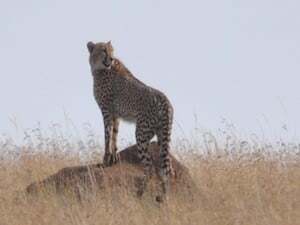 But there she was, sitting on that termite mound like the most iconic National Geographic pose you could conjure up for a cheetah, gazing across the grass toward a herd of Thompson’s Gazelle. Below her were two cubs, all claws and teeth and snarls as they played with each other and waited for mom to deliver dinner. And miraculously for us, dinner was about to be served. Like a shot, the cheetah was off the mound and into the herd of gazelle. White bodies flew in every direction as the gazelle dashed away, but one was not so lucky, as it happens in nature, and it disappeared into the grass as the cheetah caught it easily. She brought her kill back to the cubs and dropped it, and stood panting for several moments to recover from her kill. Just then, out of nowhere, a hyena came and took the kill from the cheetah. She was too spent from her spree, and only snarled a few times before capitulating. She’d rather protect her cubs than her dinner. The hyena grabbed the kill and turned tail and ran. But he had only gotten a few paces away when again, out of nowhere, a lioness came out of the brush and stole the kill from the hyena! No kidding. We could not believe it. The food chain and the pecking, order all in one single live-action demonstration. It was incredible. And we had only just gotten here. As we traveled toward the Serengeti Serena lodge, a storm swept across the plain, a dark mass of clouds and rain that we could see coming for miles. Then it was upon us and the rain was dazzling, pounding and sheeting and even hailing a little to show off. It stayed with us the whole trip in, and as the dusk fell, we saw a few animals in shadow; a hyena crossing the road, wildebeest huddled together against the wind, and a hippo out of his wallow eating grass by a pond. It was dark and soaking wet when we got to the lodge, and since it was past nightfall, we were escorted to our room by an armed guard. “There are no fences in Serengeti,” explained the guard. “Leopards come here to eat the dik-dik at night. And buffalo too, they walk around. And they are big and mean.” With that said, lead the way with your gun, please! The next day dawned clear and we could see our lodge for the first time, another fantastic cluster of rondavels set atop a small hill with fantastic views across the Serengeti for miles and miles. There are no words for the vastness of the Serengeti, and for two supremely garrulous people, to be left speechless is something, indeed. In this awesome and primal place we were humbled silent. We spent several hours before breakfast with our binoculars looking across the plains. My favorite sighting was a giraffe, in the middle of nowhere, heading with leisurely purpose across the grasses toward some distant point he thought important to visit. We slowed by a copse of trees to admire a group of fifteen giraffes hanging out, eating and even attempting a little nookie, which as you can imagine with giraffes, is awkward at best. Then we collected Andrew and Judy and spent the afternoon touring the Serengeti, and it was sincerely a never-ending parade of wildlife. The sheer volume of impala, gazelles, wildebeest, zebra, giraffes and predators was indescribable. At every turn, there were more animals going about their business, feeding, sleeping, looking out, looking for, and just being. As the day began to wind down, we stopped alongside another truck that was parked, and Hassan chatted with the other guide briefly in Swahili. Then he smiled hugely and looked at Judy. And there in a tree was a leopard sleeping alongside a shredded, but still identifiable, gazelle carcass. As if that weren’t enough, on our way back to the lodge we came across two lions mating by the side of the road. Literally by the side of the road. As in, I could reach out of the truck and touch one, if I didn’t value my hand so much. They did not seem to give a gosh darn as we watched for the better part of an hour, as they did it every 20 minutes like clockwork. According to Hassan, it is difficult for lions to get pregnant so they do it every 15-20 minutes for a week straight, without eating or drinking water, to make sure the pregnancy happens. The following day we had more Serengeti to cover, and set out with purpose. Again we saw literally thousands of animals, the highlights of which included: four hyenas ripping apart a carcass in the mud, a number of crocodiles, including an incredibly small one that Brandon spied with his eagle eye, and a mother cheetah and two cubs spying on a herd of gazelle on top of a termite mound, which we abandoned to see yet another pair of cheetahs on a bigger termite mound very close to the road. The next day we left Serengeti and headed back toward the Ngorongoro crater. On the way we stopped at a Masai village and were treated to some songs and dancing a lot of jumping, which is a big thing with the Masai. At 5-4 and 5-7, we were definitely the shrimps about town, but despite our height inadequacies, we were graciously given a tour of the Masai homes by the chief’s son, then treated to a song by the schoolchildren. The Serena Crater Lodge was stunning, built right into the side of the crater wall and designed to look like a pile of volcanic rocks to blend naturally into the topography. Here was the only time Hassan’s smile wavered: “It is very cold here, yes?” he asked, and pulled out his fleece. It was 60 degrees and falling as the sun went down below the west edge of the crater and we parted ways at the reception desk, us to find our room and Hassan to fill up on hot tea. Our room looked out over the crater, and below a light fog hovered over the wilderness. We stood and listened, and could hear the ‘gnuu-gnuu’ of the wildebeest rising up through the fog. Tomorrow we would go and see them for ourselves. To say that the drive down into the Crater was scary would be an understatement, but Hassan drove competently as the single-lane dirt track wound down and down, and soon enough we were on the bottom of the old volcanic cone, looking several miles across to the other side. Here was a totally self-contained eco-system of animals -- lions, wildebeest, zebra, hippos, birds, jackals, vervet monkeys, gazelle, impala and, yes, rhinos. He smiled, and took us to a huge hippo pond, then around to see yet another pair of mating lions, then drove slowly along a marching line of wildebeest trekking across the length of the crater toward the watering hole. Then, two vehicles sped past us. Hassan watched them go, then picked up his phone and called a colleague. Then he too turned tail and sped down the road the way we came, back toward the watering hole from that morning, following the wildebeest. All of a sudden there she was: A rhino. “Rhinos can release up to 10 liters of urine at a time,” said the all-knowing Hassan, answering our collectively unspoken question. That’s a big bladder. We spent a long time with the rhino. There aren't many of them left on the planet, and we could very well have been looking at one of the last remaining ones in the wild. For her part she seemed unaffected. Sometimes ignorance really is bliss. Since we had experienced more than 20 collective hours of “African massage” in a Range Rover bumping along on a dirt road, we decided to treat ourselves a real massage back at the hotel, couple style. As we lay side by side on the massage tables and got our kinks worked out, we smiled at each other. This trip was awesome! And it wasn’t over yet! The next day we said goodbye to the crater and headed to Tarangire, a park known for its elephants and baobabs, towering ancient trees which look like they’ve been turned upside down so their roots are sticking up into the air. As we entered the park we saw an eland, “the biggest gazelle in Tanzania,” according to Hassan, then bang, right out of the gates we saw three of the Big Five: Lions crossing the road, elephants pushing over shrubs, and a leopard snoozing in a tree, which seemed to be their specialty. We also saw two cheetahs sleeping in the grass within 20 feet of the truck. (If you’re counting that’s 10 cheetahs so far. So much for not seeing any at all!) Brandon was on cloud nine. Our hotel this time was a Sopa lodge, with the same basic rondavel design of the Serena lodges inside the park perimeter. After a late lunch with lizards and starlings trying to steal a bite here and there, we were back in the truck as the sun tipped westward. The elephants here were prolific, and we stopped in the middle of the road as a huge herd of 20+ came up from the river, grazing leisurely along the way. We turned off the truck and sat silently as they trundled up and around the truck, literally surrounding us as they went uphill, casual, easy and mellow. A tiny baby elephant dragged a stick around in the dirt, drawing a helter-skelter design as she trotted after her mother, then dropped the stick in favor of food and nursed a bit while mom was engaged with a pile of tall grass. The elephants passed and we drove on, sighting baboons silhouetted in a dead tree, a number of dik-dik dashing through the grasses by the edge of the road, and a bunch of vultures hulking on a big stump. The sunset was amazing, and we headed back to the lodge as the animals were lying down to sleep. The next day was our last, and as we left the Tarangire park and headed back to Arusha, we chatted politics with Hassan and played good-cop/bad-cop in an overpriced souvenir shop to get a better deal. We said goodbye to our new friends, and went back to the airport, and as we took off from Arusha and ascended through the low-lying clouds, we could see Mt. Kilmanjaro, clear as day, right outside our window. We studied it until the plane turned east and headed back to the States. This was truthfully the trip of a lifetime, and even the experienced South African safari-goers, Andrew and Judy, agreed that Tanzania is incredible, with such abundant wildlife that it put their hometown Kruger Park to shame. Anyone who is considering safari should look seriously into visiting Tanzania. It is a true gem on earth. We were able to experience such a trip with the help of Traveler’s Joy, and were so thankful to have had help in collection the means to take this trip. All totaled, it cost about $12,000, which included airfare from Los Angles to Africa, excellent lodging, safari guide, park entry fees, gasoline, and all our delicious food and beverages for a week. It was completely and absolutely worth it, and we cannot wait to get back there someday.